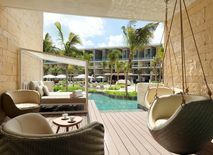 Relax in the sun and cool down in the Swim-Up pool, accessed directly from this modern suite. Choose what you find most comfortable: either a King-size or two individual queen-size beds with memory foam mattresses, for your best ever night’s sleep. 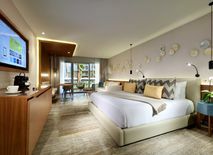 In addition, enjoy all the comforts of a Junior Suite, including sofa-bed, hydro-massage bath, interactive TV, desk, minibar, toiletries and many other extras to make your stay unique and exclusive. A large space divided into two floors, where you can enjoy the essence of Costa Mujeres from the exclusive hydro-massage bath on your terrace. Choose a pillow from the menu and get your best ever night’s sleep in either a King-size bed or two individual queen-size beds with memory foam mattresses. And benefit from all the other facilities and extras offered in the Junior Suites: full bathroom with hydro-massage bath, separate WC and shower, and everything required for an unforgettable holiday. Luxury and comfort go hand-in-hand in these spacious, modern suites A separate lounge and exclusive facilities to this room category, including a Nespresso coffee machine and a premium selection of coffee. Round off the experience with video-games and a console (on request and at an extra charge). The hotel’s most exclusive suite, offering the last word in luxury. Succumb to the pleasure of having direct access to the Swim-Up pool, and hammocks where you can relax and enjoy the Costa Mujeres sun. 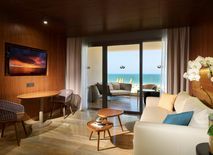 Enjoy the company of your guests in a separate lounge and with exclusive extras such as a Nespresso machine and a premium selection of coffee, in addition to all the comforts offered by the other suites. 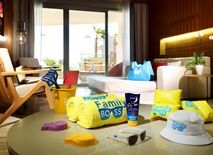 The ideal suite for families. A good rest is guaranteed in a king-size bed or in two queen size beds with “memory foam” mattresses, a sofa-bed, and a pillow menu included for both children and adults. Customized luxury with a personalized minibar and 24-hour room service. Your little ones will be able to enjoy a special children’s turn-down service with exclusive amenities just for them, as well as a welcome kit for each child. Adults will be granted priority booking in all of the restaurants with à la carte breakfast, lunch and dinner, among other services. Views that the whole family will remember. A fantastic suite divided into two levels with a second independent restroom. 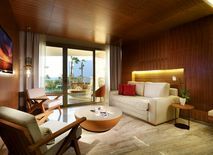 The highlight of the suite is its spacious terrace with a hydro-massage bath and magnificent views of the Caribbean Sea. 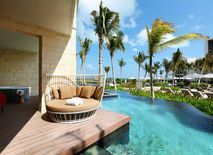 Indulge in exclusive benefits, such as unpacking and packing services, turn-down service with special amenities for the little ones, room service, 24-hour check-in and check-out and personal assistance from a Family Host during your entire stay. The most spacious and sophisticated suite in the hotel. It boasts an independent living room and a second restroom, as well as unique facilities, such as a Nespresso coffee maker and a premium coffee selection. Indulge in luxury with exclusive services for the whole family: check-in, check-out, and 24-hour room service, a personalized minibar, unpacking and packing service, a welcome kit for each child, priority booking in restaurants with à la carte breakfast, lunch and dinner, as well as various other benefits from Family Selection. Spacious and intimate. 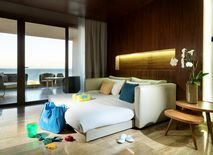 Two connected Junior Suites create this giant suite, ideal for families and groups. Both include king-size double bed or two queen-size doubles with "memory foam" mattresses, a terrace, a hydro-massage tub, a sofa bed and a interactive TV, among other exclusive amenities of Junior Suites. Enjoy your own space and the closeness of your companions in these two magnificent suites.